MH Travel Agency organizes religious Herzegovina tour for the guests who want to visit miracle place Medjugoje which was blessed by the apparition of St. Mary happened on 24th of May 1981 by 6 witnesses. From that very moment until today pilgrims and believers from all over the world visit Medjugorje every day in peace and in faith of Jesus Christ, and mother Mary, named in Medjugorje Queen of Peace. When the first apparition happened, Medjugorje was a village in Yugoslavia, republic Bosnia and Herzegovina. Despite communist party who was leasing the country at that time, message from Medjugorje was unstoppable, and has been spreed out all over the world. The witnesses were tested by the best world psychologists and doctors and all of them have concluded that all six visionaries are completely healthy and are not lying. All of the visionaries has gotten a numerous messages from Blessed Virgin Mary and all of them were presented to the people. The citizens of Medjugorje believe that St. Mary has chosen that place for some reason to send the people words of peace and love and faith from her Son Jesus Christ. The presentation on the statue of St. Mary-Queen of Peace in St. James' Paris Church is exactly in the body size and descriptions of the witnesses. 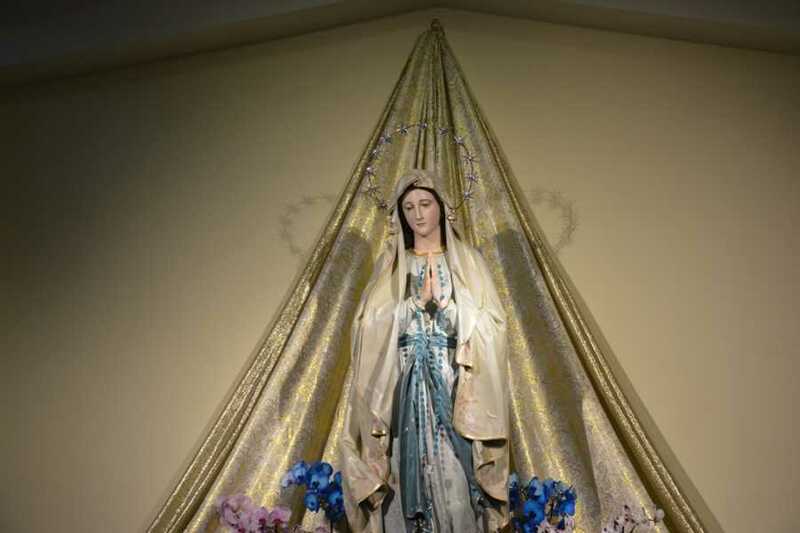 Our Lady of the Peace appears to be 18 to 20 years old, slender and around 165 centimetres (5 ft 5 in) tall. Her face is long and oval. She has black hair. Her eyes are blue with delicate eyelashes and thin black eyebrows. She has a little nose and rosy cheeks. She has reddish thin lips and her smile is more like some indescribable gentleness. It's visible as if somehow under her skin. Her simple dress is bluish-grey and falls freely all the way down to the little whitish cloud on which she is standing. Her veil is pure white and covers her head and shoulders. It also reaches down to the little cloud. She has a crown of twelve golden stars on her head. All presentation of St. Mary on souvenirs, statues and painting follow this description in Medjugorje. The first witness Mirjana Dragićević Soldo says that every person who want to visit Medjugorje is invited by St. Mary-Queen of Peace directly. She wants us to open our hearts and be guided by her in the name of love. If you want to meet this holy place be our guest and take a look at our itinerary. The tour starts from Budva, then continues to Kotor where we pick up the other guests and continue straight to waterfall Kravice in municipality Ljubuski. Waterfalls Kravice are Park of Nature on the river Trebižat. It was created by the flow of the tuff surrounded Trebižat river and as a natural phenomenon its under the country's protection as a natural rarity. The hight of the waterfall varies from 26 to 28 meters, with the water amphitheater under the waterfall with a diameter of 120 m. Over the tuff filled layer, from the top to the bottom of the waterfall,many plants such as grass,moss and ringworm grow. Along the waterfall hemp, figs and poplar have spring up. Next to the waterfall many mills and stoods for rolling cloth were once active. From the main boom gate to the waterfalls is 15 minutes of moderate walk by stairs down the small hill. But, there is an electric train which operates in spring and summer for the guests who don't want to walk, especially up to hill, back to the exit. We will make a photo stop for the waterfalls but we don't have time for swimming and water activities. After visiting the waterfalls Kravice we will continue our trip 15 km further to Medjugorje. Our first stop will be St. James' Parish Church in the center of the city, where the guests can see the statue of St. Mary- Queen of Peace, make prayer, confession, visit the church, the complex around the church and exterior altar with 5000 seats and buy some souvenirs. The next step will be go to The Apparition Hill which is located 3 km far away from the St. James Church. Hiking up the rocky path on the hill lasts up to 40 minutes for average body condition to reach up the summit of apparition. Silence is requested. Be aware that in summer can be very hot, so take some water with you, and adequate shoes. After visiting the The Apparition Hill we are coming back to Montenegro. This tour doesn't have stops for breakfast and lunch, because we don't have enough time for breaks, but we will stop for guests to take some snack, go to toilet, or short break for coffee or tea. Guest can bring their own food on the tour if they want so. Our guides will take care of the guests, their needs, and help them in any way, but they will not lead the guest on the The Apparition Hill. This tour is based on individual or group requests for religious tour, and our agency just provides visit Medjugorje, There, gusts can do or visit what ever they want according to their reason for visiting that holy place. After our visit of Medjugorje we will be heading back to Budva and Kotor. Guests can use their own food and drink (lunch are not mandatory).